Chris Young was signed to slug left-handed pitching. Seriously. That was probably mixed in with the wording in his contract. In 2016, he did perfectly fine. Young tortured lefties, started in a pinch, and for a decent part of the 2016 season, he was white-hot, and kept left field from being a complete black hole until Andrew Benintendi got called up. He did his job well. 2017? Well, things got worse for the outfielder. Young didn’t suffer any injuries that required a stint on the disabled list, but his performances instead suffered from an odd pattern of usage. He had his high points, of course, but the lowlights were more common, and there was a time where he actually started over Andrew Benintendi. Don’t worry, it was totally justified and wasn’t at all a waste of time for both players. Promise! Well, his high points certainly were fun. He put the Red Sox ahead in a 13-inning win in St. Louis. Young’s basically an unsung hero at this point. Young also had two multi-HR games, which is pretty wild considering he had less than 300 plate appearances. He certainly made them count. The second-oldest outfielder on the team could still barrel it up just as well as the youngest of them, it seems. You see those two highlights up there? Notice how the pitchers he’s facing are both right-handed. Young’s struggles can be attributed to facing more right-handers, and a not-so-spectacular performance against lefties compared to 2016. Last year, Young saw 144 PAs aginst RHP, and this year, it went up to 160. He had a .590 OPS against left-handed pitching as well, so no matter the handedness, Young was having issues. But it certainly doesn’t help when you can’t even be deployed correctly, or when your manager plays his hand too early and the opponent changes pitchers. Also, for reasons related to rookie struggles (I assume), Young got starts over Benintendi midway through the season. Sure, some were against tough lefties, but Young ended up facing a fair few right-handed starters as well. As much as you want to give Young some playing time, you need to let your 22-year-old outfielder figure things out for himself. Maybe bench him for a day or two, but don’t predominately use Young over him for a substantial period of time. Benintendi’s track record shows that he’s too good a hitter for him to lose PAs to Chris Young. While Young is a useful bench piece, he’s not a starter anymore. Just let him be a bench guy. He didn’t need to be pressed into service like that. While he saw a good amount of action in the first half, he didn’t do much once the All-Star break passed. 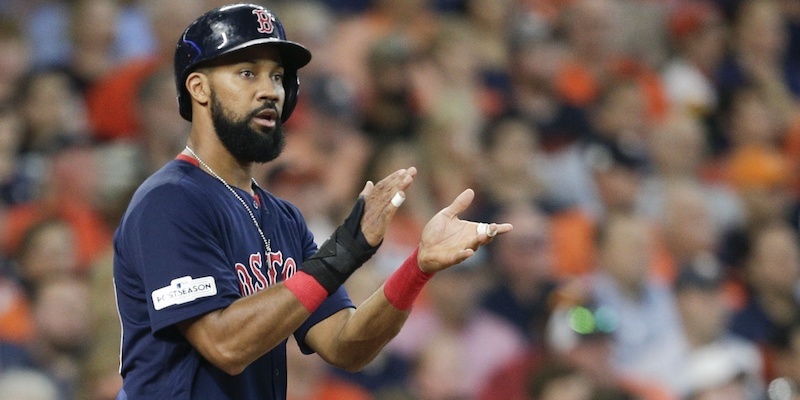 Young wasn’t even on the ALDS roster until Eduardo Nunez’s knee broke down again. That’s how much they went away from him in the second half. Not anything for the Red Sox, probably. Young’s contract ended once the 2017 season concluded, and the outfielder is now a free agent. The Red Sox could certainly bring him back if they wanted, but it’s not something they’ll focus on until the tail-end of the offseason. Bryce Brentz could step in and do his job if the Red Sox felt like using an in-house option, but they didn’t even bring up Brentz when the rosters expanded last season, so it makes you wonder if they’ll ever use him in the majors again. Barring a surprise re-signing, 2017 looks like it’ll be Young’s final season in a Red Sox uniform. The man did his job, and that’s all you can really ask for from a player like him. Roster Recap: What Do We Make of Drew Pomeranz?